A couple of years back, I attended a public briefing by SESB on the proposed construction of coal-fired power plant in Lahad Datu. During the business matching presentation, an officer mentioned that Universiti Malaysia Sabah (UMS), Kota Kinabalu campus is the single biggest energy consumer in Sabah. So, this campaign is actually overdue but it's good that they have decided on things, and went ahead with the commendable effort. UMS Vice Chancellor, Dr. Mohd Harun launching the Sabah Green Campus Office Awareness campaign. It's attitude and practice that matter! For a campus with hundreds of air-conditioned room, and with so many structures that use massive amount of energy, the most important 'parameter' that the higher learning institute needs to address is the people's attitude towards energy conservation. A 'simple click' on the power switch as you leave the lecture theater or tutorial room can make a whole lot of difference. You can make the difference today! "Through the Green Office Awareness campaign, it is hoped that UMS citizens can change their attitudes that can help save energy in the workplace.., that this attitude change can help reduce daily operating costs in energy consumption in the campus and through this environmental sustainability, demonstrate an exemplary commitment to environmental conservation"
KOTA KINABALU: Universiti Malaysia Sabah (UMS) has taken another step towards becoming a reference centre in environmental conservation among higher learning institutes (IPT) in the country. 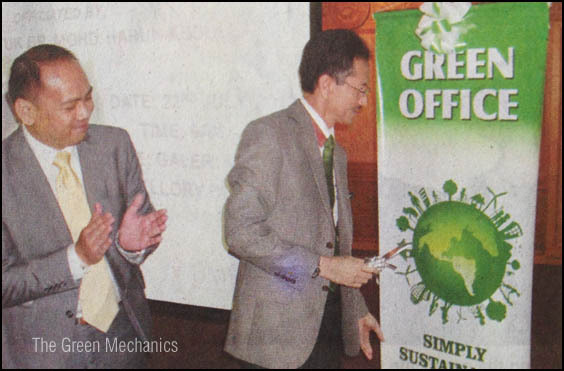 The university yesterday launched a Green Office Awareness Campaign, as part of a five-year strategic conservation plan it adopted in February this year, which will make it the first campus in Malaysia to achieve ‘EcoCampus’ status by 2017. Vice Chancellor Professor Datuk Dr Mohd Harun Abdullah, when officiating at the launch held at the UMS Chancellory Building, said the university is fully ready to embrace environmental values and elements in all aspects of its daily operation. The objective of the awareness campaign, he said, was to put greater emphasis on smart management of energy and other resources in the campus. “We strongly believe that UMS as an IPT should be responsible in promoting and enhancing knowledge and awareness on environment protection, especially among its campus community. While we prosper economically, sometimes, we don’t realize that the use of modern technology such as air-conditioners could contribute to pollution and global warming. As such, it is our hope that through this campaign, we will be able to inspire a change of attitude in everyone in UMS, towards better managing and utilizing energy,” he said. He added that smart consumption of energy and resources is not only in tandem with the university’s effort in environment conservation but will also help reduce operation cost significantly. UMS the biggest SESB consumer! I blame that for wrongly design building and cooling system.